Tags: Autumn, challenges, disabilities, Randy. Autumn rests at our feet on a recent plane trip. Delta Airlines recently announced a new disappointing policy for all animals traveling with them effective March 1, 2018. It creates unreasonable travel restrictions for teams like Autumn and me. 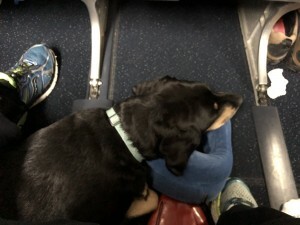 Several other airlines are evaluating how to follow suit and I want to credit United Airlines for excluding trained service dogs from these policies. Specifically, this new policy requires anyone traveling with their animal to download a form from their website, have it filled out by their veterinarian to confirm the animals rabies and similar vaccinations, and then upload this form through the Delta website within 48 hours of traveling. While this doesn’t seem an inordinate burden for a particular planned flight, it is compounded tremendously by the possibility of unexpected travel on Delta. Airports reroute a traveler due to cancellations and missed connections routinely and if any of these required a new Delta leg, we could become stranded by this policy. Bereavement or emergency travel would obviously be beyond consideration for them and all of this ignores the ability to have stored the form with them or to note that her rabies information is always on her collar. If my journey has multiple airlines and they all have similar policies, I’m getting multiple forms downloaded, printed, out to my vet, home, scanned, uploaded to the various websites for each and every trip. All while knowing any change in plans could leave me stranded anywhere around the country depending on how extensively the draconian Delta policies are adopted! At the very least, these need to be standardized for all airlines to accept the same form for the entirety of any trip! Why did they make this change? While most of the country operates under the American’s with Disabilities Act (ADA), airlines operate under the Air Carrier Access Act. In this they have opted to allow a much broader support animal. I do not have the qualifications to know the need or training for all the variations of animals and need in this situation. I do know that under the ADA businesses have been managing a large amount of false service dogs as people choose to forge the process in order to bring their dog where they want. This problem is only intensified with the broader definition of both need and types of animals allowed. Peacocks, pigs, and tarantulas are all recent animals which may or may not have been legitimate but illustrate the diversity in progress. All this said, it was a non-service dog attack on a flight which likely sparked the most recent change. While the paperwork policy will not add any protection from such attacks, it may provide additional liability benefit. I absolutely acknowledge there is a problem and I want to see a resolution. I believe when Delta chooses to be a Maverick they take the risks of their failings as well. For now, I want to simply applaud the better choice made by United Airlines than the disappointing choice made by Delta. My personal experience suggests Jet Blue is trending towards a little additional airport paperwork which can be managed at the airport, more in line with United, but still more delays and challenge for me. Trying to discern what all the various rules may be for all the individual airlines is going to make the challenges exponentially more difficult. 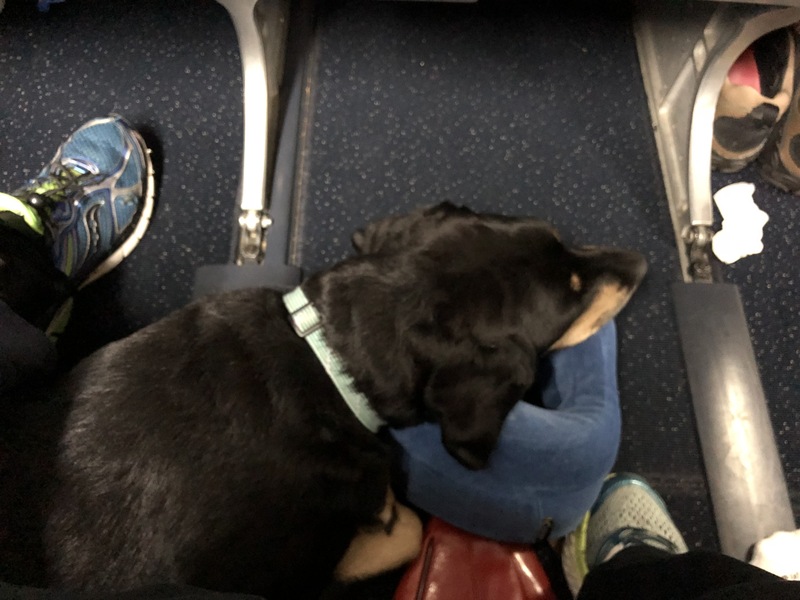 There was progress made in an initial conference in 2016, but reports make clear the airlines are having a problem, though it is not with service dogs. I hope the parties making policy would consider bringing a conference of stakeholders together to ensure a more reasoned and consistent policy may be planned and implemented with an expectation of more reasonable results than the risks ahead for Delta leaving customers stranded even after expecting them to take on some unreasonable amount of work.